Clickable locality map for the Ballina, Byron Bay, Tweed Coast, Tweed Heads, - Upper Clarence, Northern Rivers, NSW, and Gold Coast hinterland, QLD, region of Australia. 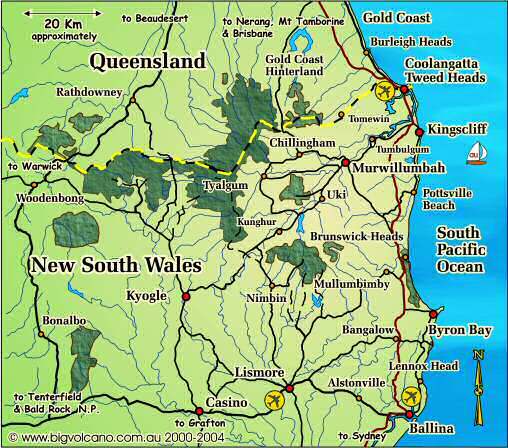 Clickable locality map below of the Ballina, Byron Bay, Tweed Valley, Kyogle, Casino, Upper Clarence, Northern Rivers of NSW, and Gold Coast hinterland, QLD, region of Australia. Move your mouse over the places to see which ones change your mouse cursor, then click on that town, village or locality name to go to information, with links to local and nearby accommodation and attractions: click on "Back" in your browser or the page icon map to come back here. Or go to our places by selecting from our Country, Coast, Rainforest and River localities as shown below.